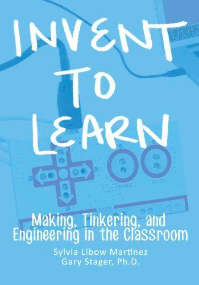 Through today, you can download a Kindle version of Gary Stager and Sylvia Martinez’s new book Invent to Learn for free. You should do so. Really, you should buy the book. (Amazon Affiliate link) Hailed as the “bible” for bringing the maker movement into schools, I think Invent to Learn is the most important education book published this year, offering not just a vision of how “making” and “tinkering” could transform classrooms, but a practical guide for how to move school in a more constructionist direction – how to design better learning environments and projects, how to foster wonder and build capacity in children (and adults), and how to combat the drudgery of a standardized-test-obsessed school system. 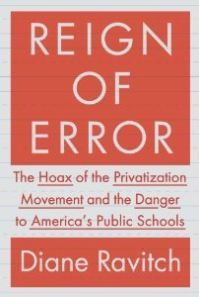 To call Invent to Learn the most important education book published this year runs counter, I realize, to many of the reviews out this week for Diane Ravitch’s latest, Reign of Error: The Hoax of the Privatization Movement and the Danger to America’s Public Schools. (Amazon Affiliate link) An education historian, Ravitch is one of the most prominent and controversial figures in education policy debates, and her 21st (!) book will no doubt be a bestseller as her last one was. The new book retreads much of the territory of that previous one, The Death and Life of the Great American School System: How Testing and Choice Are Undermining Education (she really likes the titular colon, doesn’t she). The arguments of both books, this time made with less patience, more fervor: that “corporate education reform” is grounded in false claims about “broken schools,” something that in turn fosters efforts to privatize the US education system. “Your critics say you are long on criticism but short on answers.” Ravitch begins Reign of Error recounting an episode with the film critic David Denby telling her this while on a speaking tour for her last book. So this time, she says in her Introduction, she’s offering solutions not just criticisms. This is one of the weaknesses of the book, I think, something that gives it a structure that makes Reign of Error read like a long list of political talking points rather than historical narrative. I’ll admit I’m biased here when I say “skip the solutions!” as I’m working on a book that raises far more questions than it gives answers for. But I see great value in penning a detailed critique about “what’s happening” or “what’s wrong” without having to provide prescriptions for “what’ll fix it.” Unlike Invent to Learn, which as a guide must make very practical and doable suggestions, Ravitch’s book isn’t a guide and so doesn’t really succeed in fulfilling the conventions of that genre. It doesn't really work as "history" either. It’s more stump speech than scholarship. Don’t get me wrong. It isn’t as though I object to much of what Ravitch proposes here. Access to high quality early childhood education for all. Access to prenatal healthcare. Democratic control of schools. An end to high-stakes standardized testing. But I’m not confident these solutions get at the heart of what is wrong with our current education system – a system that, without a thorough diagnosis, feels as though Ravitch has written herself into a corner here to defend. Some of this defense is a nostalgia on her part for a pre-RTTT and NCLB-era education (nostalgia, as Deborah Meier points out, for an education that never existed for everyone). And some of the defense is her curricular conservativism too. Certainly the defensiveness is understandable if you see public schools as “under attack,” which Ravitch clearly does. She spends the first twenty chapters of Reign of Error countering the narrative that “schools are broken,” examining “the facts,” as she puts it, about test scores, graduation rates, the achievement gap, and so on and debunking many of the claims she ascribes to education reformers. Claim: Test scores are falling, and the educational system is broken and obsolete. Reality: Test scores are at their highest point ever recorded. Claim: The nation has a dropout crisis, and high school graduation rates are falling. Reality: High school dropouts are at an all time low, and high school graduation rates are at an all-time high. She makes her case by pointing to statistics – and alternative ways to interpret these statistics – about academic achievement that challenge the “failing system” story. And rightly so. “Education is broken” has become a powerful narrative over (at least) the last 30 years – not just in political circles but in casual conversation too. A 2012 Gallup poll found only 29% of Americans were confident in the public school system, for example. It’s worth scrutinizing closely this narrative, not only to examine its veracity or to investigate who benefits financially, but to ask why has it become so widely accepted. This, dare I say, would be a great job for a historian. I hear this narrative of crisis quite often in ed-tech industry circles, and I don’t dispute Ravitch’s assertion of its power. Take the PandoDaily piece on “The promise (and refreshingly low hype) of online education,” for example: “High school and elementary school are broken. College is broken. There’s a major distribution problem that the Internet is finally poised to revolutionize, and there are renewed calls to rethink basic vocational training. There’s also money to be made in groups like General Assembly, teaching people to code and hobbyist sites that teach obscure, one-offs like knitting or photography.” Education is broken -- insistence, but no proof. This or that app will fix it -- never any proof. But the financial interests behind the argument are pretty clear. Or, they’re clear to me at least. But I think Ravitch is less successful in making these interests and connections clear to her readers, in many cases working with the assumption that they’ve already seen through “the hoax of the privatization movement.” She says in the first chapter of the book that we’re witnessing a “deliberate effort to replace public education with a privately managed, free-market system of schooling.” And maybe we are. But I’m just not sure that the rest of the book, focused as it is on refuting the “schools are broken” narrative, substantiates that claim. Not carefully. Not thoroughly. There’s lots of research here about the problems with TFA and charter schools and merit pay. But it’s sandwiched in between polemic. Of course it is. Debates about education reform have become increasingly acrimonious, and Ravitch is no exception to that. She is one of the loudest supporters of teachers in a political climate that is profoundly anti-teacher. She has become one of the fiercest critics of education reform in a political climate that is, at the major party level at least, almost unanimous in its support for it. But in her attempts to challenge the “schools are broken” narrative, I worry we’re left with the unstated reverse: “schools are fine” (or at least those schools that aren’t in high poverty areas). Even if we were to scrap high-stakes testing tomorrow and institute, as Ravitch calls for, “a full, balanced, and rich curriculum including the arts, science, history, literature, civics, geography, foreign languages, mathematics, and physical education,” I don’t think we can say “schools are fine.” Not if they remain coercive. Not if there is inequitable funding. Not if classrooms remain teacher-centered. Not if access to powerful computers and to the open Internet is denied. Not if students sit, grouped by age, in rows of desks and move from subject to subject when the bell rings. Not if students are mostly listening and rarely building. That’s where Stager and Martinez’s book Invent to Learn comes in as a manual for educators (and parents and principals) – one that could help reignite the progressive education movement and shift school into the hands of modern learners. That makes the book incredibly political, mind you, but the transformation it calls for isn’t simply at the level of policy. The change is pedagogical; the change is technological. It’s this last piece that, I admit, has frustrated me the most about Ravitch’s work. Again and again, she has called into question the value of technology in the classroom. And as Stanford education professor Larry Cuban recently observed, it will sadly be the Common Core State Standards’ mandate for computer-based assessment that finally – finally – puts computers in the hands of all public school students. But to resist that needn’t force us to insist “no tech at all.” Technology is neither good, nor evil nor neutral as Kranzberg's law reminds us. Yet the only mentions that technology warrant in Ravitch’s book involve its role in data mining and in cyber charters -- "evil." Surely, as we think about what school can and should be with the advent of the computing technologies, there’s much much more. The millions of page-views Ravitch touts for her own blog point to some of that. I don't think we do anyone any service by neglecting nuance around education technology – it’s neither wholly corporate enslavement nor wholly liberatory. Not our political allies. Certainly not our students. We must ask who promotes technology and who profits, sure, but also how is it used, for what learning objectives, and so on. The same goes for all our education practices. The same goes for all our learning spaces. This is why Invent to Learn matters. It matters as a defense of democracy, community, and learning in ways that Ravitch’s book, buried as it is in policy and polemic, cannot accomplish. Invent to Learn offers a vision of technology in the hands of learners and in the service of progressive education. And frankly, as much as she’s become an outspoken critic of reform and privatization (and certainly there is plenty of that in ed-tech), progressive education – learner-centered, hands-on, open-ended exploratory messiness – has never been Ravitch’s thing.